Who wants to marry a millionaire? If you're trying to meet wealthy would-be significant others, the results of a recent survey might offer you some ways to increase your chances. It's no surprise that many millionaires who travel prefer to fly (instead of, say, taking a train or riding the bus). But all airlines are not created equal when it comes to deep-pocketed passengers. So according to the survey, while you'll find the richest folks on United flights, more rich people fly Delta. And American seems to offer the best chance at landing a sugar daddy (or mommy, presumably). The Latvian airline airBaltic will soon allow passengers to select their seats based on "mood." The airline is introducing a service called "SeatBuddy," which aims to park you next to like-minded fellow passengers based on whether you're interested in relaxing, focusing on your work, speaking a particular language, discussing a certain hobby or interest, or networking to get ahead. Meanwhile, Planely.com connects passengers with others who are likely to be pleasant or productive seatmates. Register at its site and describe your interests, and the service suggests seat buddies from among other members on your flight. It can even help you find friendly sorts with whom to share a meal at the airport or a ride to a hotel. Satisfly.com seems similar, but it currently concentrates solely on airBaltic flights. KLM and Malaysia Airlines, among others, are also getting into the act, experimenting with letting passengers choose seatmates via data from Facebook (FB) and LinkedIn (LNKD) pages. 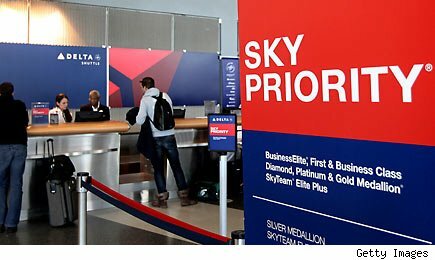 Will Airlines Fly Higher in 2012? In the grander scheme of things, no one should pin his or her retirement plan on someone else's riches. Sure, keep flying American Airlines if you must, but save and invest your own money for your golden years, too. The nation's wealthiest are worth a combined $1.53 trillion. Here are the top 10 Americans raking in the dough. And don't discount those frugal Southwest-flying millionaires, either. They likely have the habits and mind-set to keep building wealth instead of squandering it. As many studies have shown, our modest neighborhoods quietly house many millionaires who live in simple homes, drive far-from-new cars, and put many dollars away for tomorrow. Longtime Motley Fool contributor Selena Maranjian, whom you can follow on Twitter, holds no position in any company mentioned. The Motley Fool owns shares of Facebook and LinkedIn. Motley Fool newsletter services have recommended buying shares of Southwest Airlines and LinkedIn.